In 2004, following completion of her Masters at King’s College, London, Maeve began working at RPS Consultants as an Environmental Scientist. Initially she worked on Phase 1 and Phase 2 contaminated land assessments. In 2006, she was promoted to Consultant and progressed to working in a range of areas, including environmental compliance audits, Environmental Management Systems (EMSs) and Environmental Impact Assessments (EIAs). She became Senior Consultant in 2008, and was seconded to the Planning Division to carry out more specific Windfarm EIAs. Feeling that she could affect more change through being based within a company, in 2009 Maeve was contracted by Accenture as a Lead Environmental Specialist. There she worked on maintaining and developing new EMSs across the UK and Ireland. A desire to work strategically, implementing environmental policy within companies led her to move to Network Rail in May 2009 to develop practicable strategies delivering their Sustainable Policy. 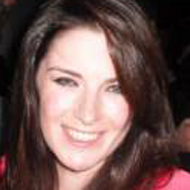 In July 2010 Maeve began working for Channel 4, developing their Corporate Social Responsibility (CSR) and environmental strategies. Having gained a good level of experience across a broad range of sustainable development subject areas, Maeve chose to formalise this by becoming a member of the IES and a Chartered Environmentalist in 2010. Maeve’s responsibilities at Channel 4 include building on the existing CSR strategy, developing an environmental management framework and integrating sustainability into other non-operational aspects of Channel 4’s activities. A current project of particular interest for Maeve is “Maggie’s Night Hike”, an initiative set up by Maggie’s Cancer Caring Centres. This is a 10 or 20 mile hike around London in September taking in famous and iconic buildings. Channel 4’s Horseferry Road building is one of them and Maeve, along with other Channel 4 employees, will be volunteering her time in the evening to accommodate the hikers as they visit the building. Maeve is particularly excited by this as it enables her to engage with the wider social agenda, an area she is relatively new to and to gain experience in. In the future Maeve plans to continue to try and identify the most practicable strategies for integrating sustainable working practices and raising CSR up the agenda.